The symbols of Dubrovnik are described in the Town Statutes Statut Grada Dubrovnika (pročišćeni tekst), published on 23 January 2001 in the Town official gazette Službeni glasnik Grada Dubrovnika, No. 1. This is repeated in the current Town Statutes Statut Grada Dubrovnika (pročišćeni tekst) (text), published on 27 January 2006 in Službeni glasnik Grada Dubrovnika, No. 2, and in the current Town Statutes Statut Grada Dubrovnika (text), adopted on 3 July 2009 by the Town Assembly and published the same day in Službeni glasnik Grada Dubrovnika, No. 4. 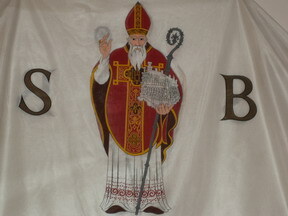 The flag (photo, 17 June 2006) is the St. Blasius flag, based on the primary flag of the Republic of Ragusa, and readopted in the 1990s. The flag is prescribed in proportions 2:3, but in most occasions it is used in the usual 1:2 proportions, especially when displayed together with the national flag, which is often the case. During the annual St. Blasius Feast - the main religious ceremony in Dubrovnik, honouring the town's patron saint - variants of the town flag are erected along the main street on temporary flag masts (photo). The variant has a golden outline, four rectangular tails (and what appears to be a red stripe along the hoist, but that may simply be the sleeve made of different material). This is not the ceremonial flag of the town, which is supposed to be made in a single copy. The Libertas flag of Dubrovnik is intrinsically linked with the Dubrovnik Summer Games, a theatrical festival held since 1950, probably the most prestigious such festival held in Croatia. The historical Libertas flag is hoisted in the town during the festival (meaning most of the July and August every year) to denote the freedom of artistic expression - extended from the general value of Liberty that the flag historically denoted in the Republic of Ragusa. A number of various designs has been used since 1950. While every year (or every few years) the festival has a new logo, basically consisting of a stylized flag with inscription Libertas, it seems that the actual flags are made in a slower pace and do not follow the general annual change of the emblem. The use of flags on the Orlando Column is prescribed by Decision Zaključak o isticanju zastave Republike Hrvatske na Orlandovu stupu, adopted on 27 August 2002 by the Town Asssembly and published on 3 September 2002 in Službeni glasnik Grada Dubrovnika, No. 6. The Decision determines that the flag to be hoisted on the Orlando Column daily is the national flag, except for the Day of St. Blasius (3rd February), the town's patron saint day, when the town flag is hoisted there, and during the Dubrovnik Summer Festival, when the Libertas flag is used. Moreover, the Decision calls upon the store owners etc. to hoist the national flag for national holydays, and orders the Town office to propose a "more proper" way of hoisting the national flags in the town. The Libertas flag hoisted on the Orlando Column is white, bordered red, in proportions c. 2:5, with swallow tail and red inscription "LI/BER/TAS" next to the hoist. The flag appears to be used only at that particular mast and not in other location of the town. A white flag bordered in golden yellow, charged with a stylized red flag, is used in prominent locations around the town throughout the year, including most prominently the Minčeta tower, a large round fort with a massive base and the highest point in the defensive outer walls surrounding the old city. The design used around 2010 (photo) included a red stylized flag with three wavy tails, outlined in yellow. The flag seems to have been recently replaced with stylization with a more stylized, rectangular representation of the red flag (photos). A third version exists, as well (photo). During the Socialist period, the flag in use was red with the yellow emblem. More or less fell into disuse since in the 1990s, the flag eventually reappeared, for instance in the in 2014 opening ceremony (photo). The barry arms are an ancient symbol of the Republic of Ragusa. The burgee of the club (website) is a white pennant bordered yellow with an oval in the middle divided in horizontal blue and red stripes. From the oval towards each angle of the pennant are rising double red and blue stripes. The barry azure and gules oval is a stylization of the coat of arms of Dubrovnik.